Actual baseball games took place on Monday, albeit none of those games counted in the Spring Training standings but that’s besides the point. Baseball season has begun. Even if it is just Spring Training games. The Blue Jays even held a intrasquad on Monday, Chris Colabello swung a hot bat and J.A Happ got roughed up in his one inning of work which in the big scheme of things doesn’t mean a damn thing. What Monday’s game did do however was bring out the bandwagon fans and their lack of true knowledge or understanding of just what happens during Spring Training. With that having been said we have decided that it is time to give a Spring Training 101 to the new bandwagon fans that for the first time this spring most likely pay attention to the Blue Jays during Spring training. Really, what else are they going to want to watch? The Leafs tanking for the basement in the NHL standings? First off, all the big names will not be playing in every game. Don’t be alarmed when Jose Bautista, Edwin Encarnacion and Josh Donaldson are only playing sparingly to start the Exhibition games. Blue Jays manager John Gibbons has said the plan is to take things nice and slow when it comes to inserting the regulars into the line-up. Be prepared to watch players that are destined for the minor leagues, it will happen a lot, especially early in Spring Training. The Blue Jays overall Spring Training record doesn’t mean jack squat. Most of the players are just getting their work in to prepare for the season and for most of the regulars their day will most likely only last a few at bats before they are out of the game and headed to the golf course. Same goes for a player’s performance during Spring Training, this is even more important when it comes to pitchers, There are some starts where a pitcher especially a starting pitcher will end up just throwing fastballs during his outing, or working on command or tinkering with their delivery or release point or arm slot, so don’t read too much into a pitchers outings during the spring. Don’t read too much into some of these lesser known players numbers during the spring either, the majority of their at bats are against pitchers who are likely destined for the minor leagues. Don’t be alarmed when a starting pitcher doesn’t appear in many Spring Training games, With the glut of starting pitchers competing for the last spot in the rotation it means that there are some pitchers who will get their work in throwing a minor league game in a diamond buried in the back of the teams Spring Training complex. It’s also not uncommon at the end of the Spring to have them throw a minor league game to set their rotation spot. When it comes to a relief pitcher don’t expect them to pitch where they normally would, this is a big one especially early in Spring, the team will have a schedule set up for the relievers to get their work in, and they stick to that regardless of the game situation, so if Roberto Osuna’s first appearance this spring is in the sixth inning of the first game don’t be surprised. Same if some pitcher destined for New Hampshire or Buffalo has their first appearance of the spring in the ninth inning of a one run game. It’s just the way the schedule worked out. The last thing to remember is most of the players who will be everyday starters come into Spring ready to go and are in mid-season form fairly quickly into camp. 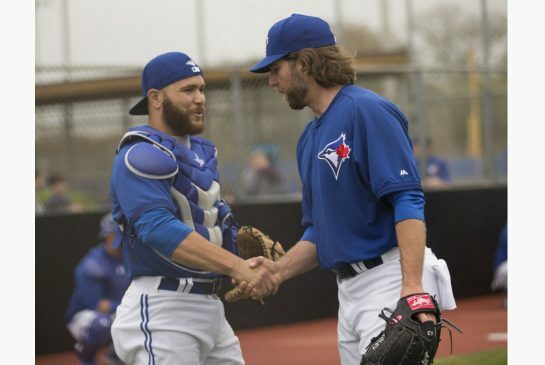 Spring Training is more for the pitchers to get stretched out and ready and for the guys who are battling for a roster spot, and hey, if the Jays do happen to get blown out of a game this Spring just remember it doesn’t mean a thing. Contract Demands Aside, Let’s Just Enjoy Watching Joey Bats This Season. It’s been a few days since Jose Bautista’s shot across the bow at Mark Shapiro and Ross Atkins regarding his contract negotiations or lack there of. It also seems like many Blue Jays fans have had a few days to digest the take it or leave it extension demand and the 150 million or perhaps higher demand depending on who you want to believe. As for Mark Shapiro saying they wouldn’t negotiate through the public or the media, I’m sure they can’t be overly disappointed that the 150 million number went public, for all we know they could have been the one’s that let it leak out to the media in the first place. After an off-season like this past winter Lord knows the Blue Jays management needs all the PR help they can get. I don’t blame Jose Bautista for the stance he is taking with the contract negotiations, he is a smart guy, he knows that he has been paid way under his market value over the life of his contract and is looking to get paid what he deems he is worth. Will he get a five year deal like he is asking? I highly doubt it, I’m sure at most teams will offer him a four year deal with a team option on a fifth year, Even that to me would be generous for a player getting up there in age. If it were me the most I’d be willing to give would be three years with a option on a fourth year. I also think that there will be a team out there willing to overpay on a contract to Bautista, but I can guarantee that it won’t be the Blue Jays that do it. I also believe that when the dollar amount of the demand went public the fan base turned from pro Bautista on the issue to pro Blue Jays management and when Bautista walks at the end of the year it will take most of the heat off of Shapiro and Atkins. This is after all a business and the Blue Jays have a budget that they have to live within, regardless of whether or not you think Rogers should spend like the big market team that in reality they are. 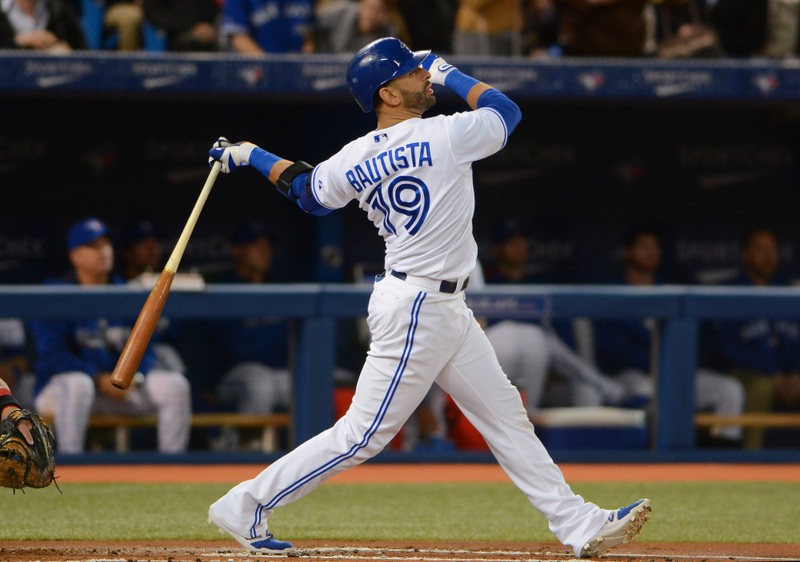 Giving Bautista 30 million a season may not be such a huge deal over the next couple of years, but once his decline sets in and the time comes to re-sign Josh Donaldson to a big money deal, paying Bautista 30 million a year won’t look nearly as good as it might have seemed at the time. There is also an argument to be made and it may not be just me being paranoid but there is no guarantee that Rogers will keep a payroll as high as it has been the last few years, even though I’ve made plenty of arguments over the years that they should be high spenders. If the team doesn’t keep winning I could see Rogers pulling back the reigns on the money. It wouldn’t be the first time and quite honestly I have zero faith in Rogers as an ownership. It be a pretty easy out for Shapiro and Atkins to use the lack of payroll availability when they explain why they couldn’t re-sign both Bautista and Edwin Encarnacion. All that aside, lets enjoy watching the Blue Jays go out and win another division and hopefully have a longer play-off run than this past season. Lets also remember a pissed off Jose Bautista is more fun to watch than a non pissed off Bautista. Over the past few years the Blue Jays have released some pretty cool promotion video’s over the years but this years video may be the coolest one yet. Nice Work Blue Jays PR department! It’s the time that I again get on my soapbox and bemoan the fact that the Toronto Blue Jays have their heads stuck in the sand and haven’t done away with the current format of their Winter Tour and moved towards a more fan friendly type of event, like a fan festival. New President Mark Shapiro hasn’t even been in his current position three months yet so the Winter Tour thing was most likely on the bottom of his list of things to do when he arrived in town. But one would think with the rising popularity of the team the past few years the organizers of the Winter Tour would realize that they must change the current format of the tour. 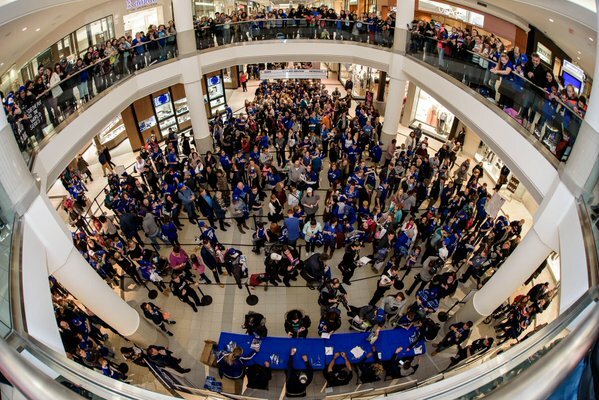 For example, the Toronto portion of their current Winter Tour had an autograph session in a mall in Newmarket on Wednesday night. The event was slated to start at 6:30, due to the crowd that lined up early the line was cut off at 1:30 pm. There is an autograph session scheduled in Ottawa for Saturday morning and I imagine the same thing will happen there. This isn’t the first time this has happened as there were people turned away from events last year as well. I’d also like to believe that Shapiro is enough of a forward thinker, he’s already renamed the “State of the Franchise’ to “The Leadoff”, that improving the fan experience is a big part of his job, it’s even a point he has brought up since he took the job. He also has the experience in improving the fan experience at the ballpark, he had a big part in the renovations at Progressive Field making it more fan friendly when he was the President in Cleveland. They even have “Tribe Fest” which they starter in 2013. So I am proposing, just as I did last year, that the Blue Jays host a fan festival. They can host it during the third weekend in January and have it at the Rogers Centre. They can have autograph sessions, Q and A sessions with current players, heck they can even trot out some of the Alumni and the TV and radio broadcasters like other teams do. They could do what they do in Oakland during their fan fest and host a “garage sale” where they sell off game worn jerseys, broken bats, Spring training jerseys and other game used items. They could even do clubhouse tours. They could charge a fee of 10 to 20 dollars and have the proceeds from the ticket sales go to the Jays Care foundation. It would be a win-win situation for all involved, the fans would have a much better experience than the current Winter Tour provides and the Blue Jays would get some well deserved good will among the fan base. The time has come, and with new leadership at the top it is my hope that they see the potential that is out there in doing a fan festival and dropping their current Winter Tour. You can thank me later Mr. Shapiro. The Blue Jays Winter Tour is well underway and today we learned that Aaron Sanchez has been training this off-season with Marcus Stroman. We also learned that Sanchez had added 25 pounds, Sanchez stated that his goal was to build up durability in order to be in the starting rotation this season, although he also says he hasn’t been told by the team to prepare to start the season in the rotation. I would assume that the Jays would give Sanchez the chance to start this Spring and with Drew Storen addition it does give the Jays a little more depth in the back-end of the bullpen, and Sanchez’s addition to the rotation would improve what some experts have called a mediocre rotation. It would also most likely bump Jesse Chavez into bullpen as the long man, a role he has experience in as he was in that role in Oakland prior to last season. 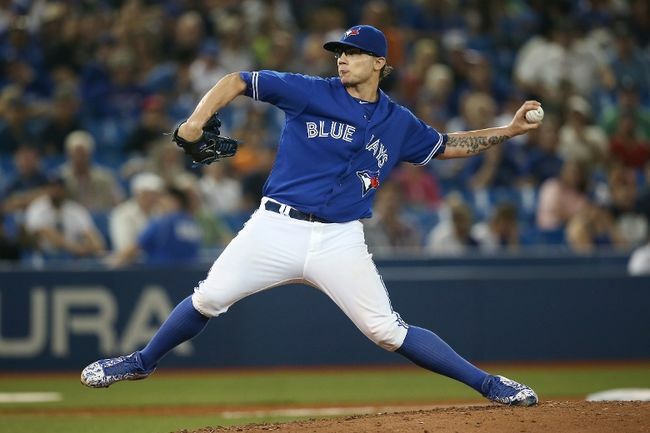 We also learned thanks to a pair of Jamie Campbell tweets that Brett Cecil’s calf muscle that he injured in the playoffs is completely healed and he will be ready come the start of Spring Training next month. Campbell also tweeted that if the Blue Jays had made the World Series Cecil would have pitched thanks to the intensified treatment he received during the playoffs. That doesn’t really surprise me considering there was talk that if the Jays had advanced Cecil would have been available, I also remember hearing that he was throwing off a mound during one of the off days during the ALCS. Stephen Brunt made an appearance on The Brady and Walker show (watch here) on Tuesday and when asked about just how long of a leash John Gibbons has with the new regime Brunt responded with saying he thinks Gibby is on a short leash and if things go south early it could be a very different conversation. I know that Gibbons was Alex Anthopoulos’ hire and the new regime inherited him and he isn’t probably their first choice to manage the team but at the time of AA’s dismissal it would have added even more vitriol to the PR nightmare that was happening. I also think that Gibbons deserves a long leash this season, in fact he deserves the full season here at the very minimum. That’s what winning a division and winning a playoff round the previous season will do for a manager. I would like to think that all of this talk is just that. I’m smart enough to realize that sports talk radio shows in Toronto like to make something out of nothing, they’ve been doing it for years with the Maple Leafs. But, just for fun let’s go back to 2002 when Mark Shapiro took over as General Manager of the Indians, he inherited Charlie Manuel as the manager. Shapiro had every intention to have Manuel manage the Indians for the full season- and he would have-but Manuel, who was in the last year of his contract, approached Shapiro about a contract extension and wanted to know if he was in the teams plans beyond the 2002 season. Shapiro abruptly fired him. The big difference with the two managers is that Gibbons is under contract for 2017 as well, thanks to his rolling option in his contract. Thanks to Bob McCown we now know what one of Alex Anthopoulos’ other job offers were before signing on with the L.A Dodgers. McCown’s co-host on Prime Time Sports. McCown said on Tuesday (watch here) that he and AA had a long conversation about broadcasting and the possibility of AA becoming Bobcat’s sidekick. McCown has even gone as far as asking Anthopoulos to come in and co-host for a week. Thanks to the Dodgers, we will never now if AA would have been any good at radio. Maybe after he’s done with baseball he’ll get into radio. The Toronto Blue Jays made an addition to their front office on Sunday hiring Mike Murov as the Director of Baseball Operations according to a press release. Murov comes to the Blue Jays from the Red Sox where he has been since 2010 where he worked as Assistant Director of Baseball Operations. Murov had worked previously with Cincinnati and Miami. Murov’s responsibility in his new role with the Blue Jays will be to assist in directing and implementing decision-making systems and process across the department and will also assist in preparation and analysis of financial, statistical and contract information, he will also be assisting in contract negotiations and preparing for the arbitration process. The Blue Jays were busy Friday morning ahead of the 1 pm deadline to exchange arbitration figures signing six players. The Blue Jays came to terms on one-year deals with Brett Cecil ($3.8million), Steve Delebar ($850,000), Drew Storen ($8.375 million), Aaron Loup ($1.05 million), Drew Hutchison ($2.2 million) and Michael Saunders ($2.9 million). 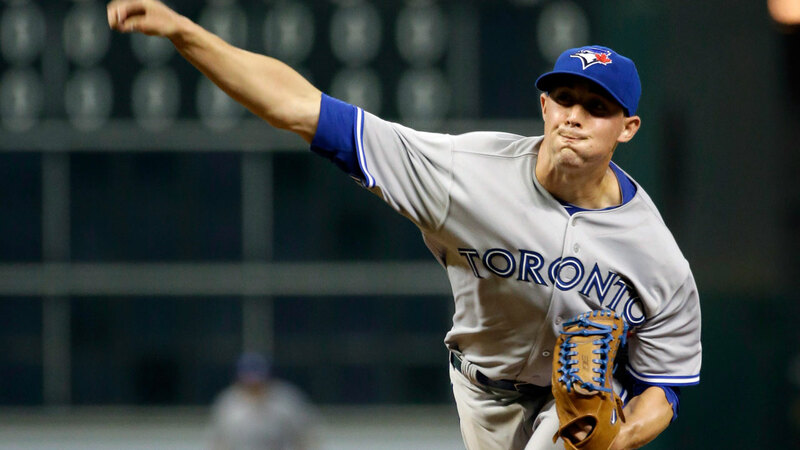 The Blue Jays were unable to come to terms with Jesse Chavez and American League MVP Josh Donaldson. The Blue Jays offered Chavez $3.6 million while he asked for $4 million. Donaldson asked for $11.8 million while the Blue Jays offered $11.375 million. In Donaldson’s case, I know it is part of the process of the arbitration system, but to the fans that have endured a disappointing off-season going to arbitration over $450, 000 to the American League MVP just reeks of pettiness from an ownership that have been accused of being cheap. Realistically Donaldson should win his arbitration case so in the end he will most likely will get his $11.8 million dollars. The Blue Jays are still a File and trial team so there won’t be any deals announced with Donaldson or Chavez before their arbitration cases. This is the last year of arbitration for Cecil, Storen, Saunders and Chavez who will all be Free Agents at the end of the 2016 season.